Last year’s Wrestlemania was always going to be hard to beat, and when 2015 began with controversy over Roman Reigns’ disappointing Royal Rumble win (and Daniel Bryan’s hasty elimination) it seemed like perhaps we would have to wait until Wrestlemania 32 to get a “showcase of the immortals” with as much emotional impact as Daniel Bryan’s Cinderella story at last year’s event. Yet Wrestlemania 32 was every bit as good, if not better, than Wrestlemania 31. From the WWE debut of The Vigilante, Sting, to the return of The Undertaker following the shocking end of his Streak at last year’s Wrestlemania, there were historic moments on offer. But nothing is as edge-of-your-seat nail-biting as the thrilling main event title match between “the beast incarnate” Brock Lesnar and Roman Reigns, a match which everyone expected to see play host to Seth Rollins’ Money in the Bank cash-in, but which no-one expected to happen in the way that it did. From the opening bell of the main show – a seven man ladder match for the intercontinental title featuring Daniel Bryan, Stardust, Bad News Barrett (before he became King), Luke Harper, R-Truth, Dean Ambrose and Dolph Ziggler – to the last amazing moment Wrestlemania never loses pace. It truly is the greatest spectacle in entertainment, and no-one given the honour of performing on “the grandest stage of them all” calls it in for the big show. Whether it’s the death-defying moves in the ladder match, the five-star match of the year candidate between Seth Rollins and Randy Orton (featuring the best RKO of Orton’s career), the big-name run-ins from D-Generation X and the NWO, Bray Wyatt bringing scarecrows to life, or the joy of seeing John Cena reduced to the mid-card while Rusev drives around on a tank, Wrestlemania is moment after moment of unforgettable action. Indeed, even when there isn’t a match happening, Wrestlemania 31 delivers – it’s biggest moment coming from an in-ring promo between Stephanie McMahon, The Rock and UFC superstar Ronda Rousey; a moment we are all crossing our fingers will lead to a match between McMahon and Rousey at next year’s ‘Mania event. 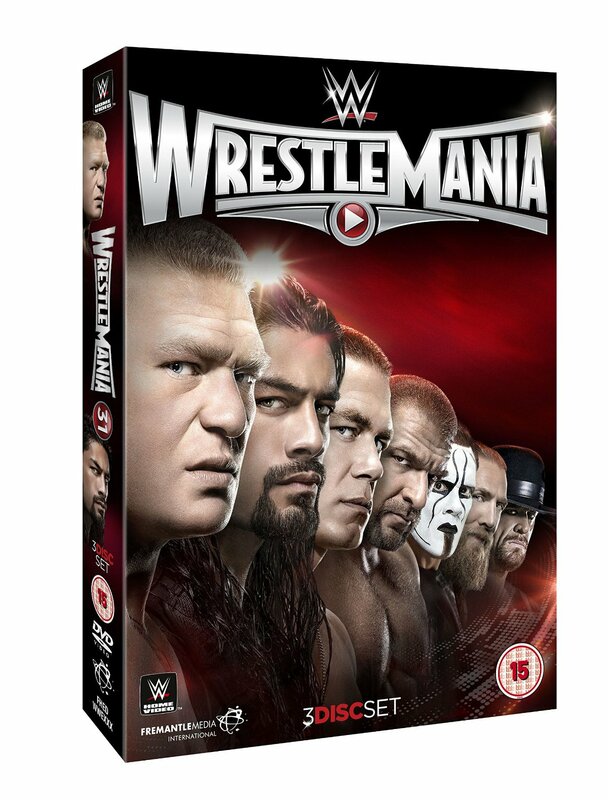 This three disc set includes all the pre-show matches: a Fatal Four Way for the WWE tag team championship and the Andre the Giant Battle Royal. We also get the Hall of Fame Ceremony from the night before, which sees the (occasionally overlong) induction of legends Macho Man Randy Savage, Rikishi, Kevin Nash, the Bushwhackers, Larry Zbysko, Tatsumi Fujinami, Alundra Blayze and Arnold Schwarzenegger. A bloated class which could have done with a few fewer inductees, but an enjoyable event nonetheless.